Buying a new van is probably everyone’s first choice. New vans start around $25,000 without customizations, which isn’t too bad. You’d then need to have any specific carpet cleaning equipment, shelving and product storage areas installed, which could add thousands to the price. You may see buying a used van as a gamble, but can actually be a good value since most of the customized equipment you will need will already be installed. The other option you have is to lease a van, which gives you the option to upgrade every few years to another brand new van. Of course you’ll want a dependable vehicle, especially if you will be covering a large area. Have a used vehicle checked out by your personal mechanic if you’re concerned about its dependability. Newer vehicles tend to be more reliable, but you should still read reviews to make sure there are no consistent defects or recalls on the van you are considering purchasing. Next, you’ll need to decide if you will have mobile equipment that is removable from the van or if you will have equipment that does not come out of the van. If you choose to have removable equipment, you will have to have ramps and slide-out ramps that will make it easy for you to get the equipment in and out. 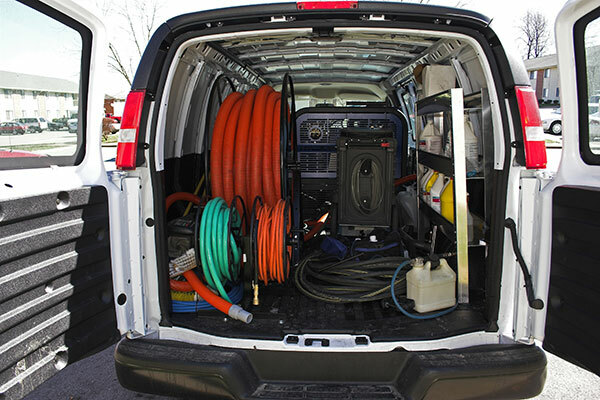 Some carpet cleaning equipment is so powerful because it is powered by the van itself. This enables your company to deep clean carpets much better than individuals can do themselves. You’ll definitely want to make sure there’s room for all of your cleaning products and equipment. Having these things organized so that they are easily accessible is important, too. A van with extra headspace could allow for overhead racks. A minivan might be big enough for your equipment. You could also look for a large SUV and remove the back seats for extra storage. For safety purposes, you not only need to have storage for products and supplies, but you need a way to secure them into place. The driver cannot be at risk for chemicals to leak in the vehicle, nor can he or she risk being hit by something, even in an accident. Finally, consider the availability of other vans that are identical to this one if you choose to add more to your business later on. Consistency will make your business seem more trustworthy to your customers. White is, of course, the most common van color. You can always customize a plain white van with decals or painting. If you choose to have a van customized in these ways, figure those things into your total price.